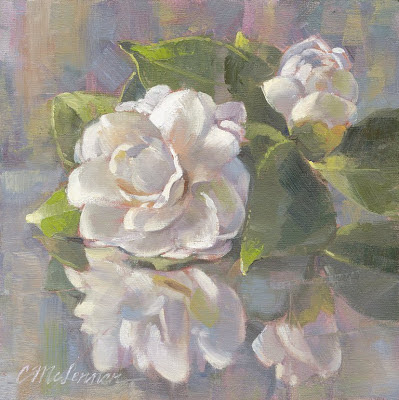 Connie McLennan : "First Camellia" and "The Bathing Woman"
"First Camellia" and "The Bathing Woman"
Here are my two latest Daily Paintworks submissions. 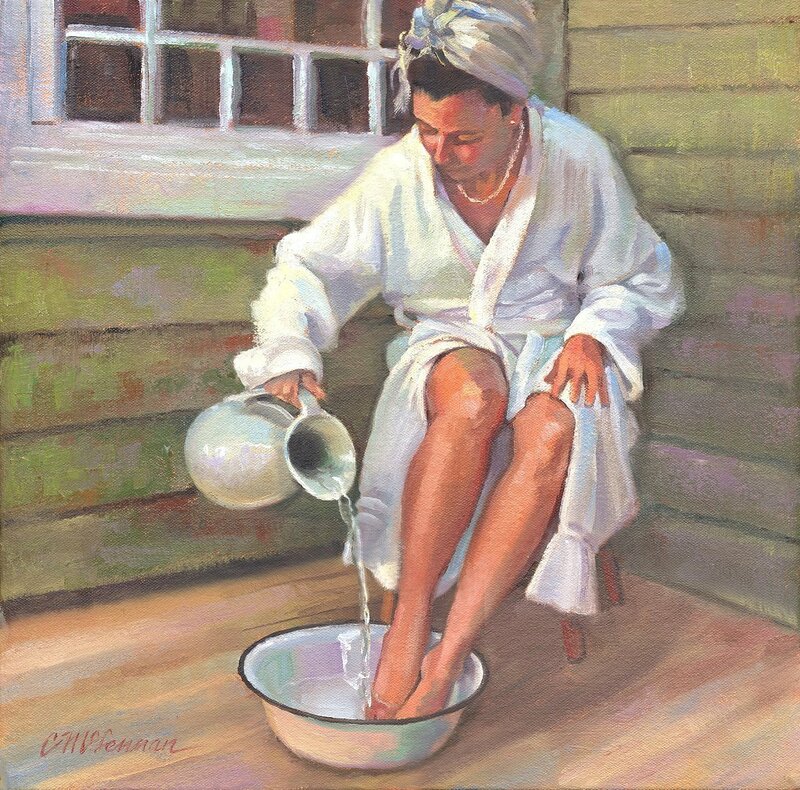 In the interest of not discouraging an occasional sale, I'm keeping remarks on my dedicated "Paintworks" blog short and sweet--and I'm trying to do that here, too. But sometimes I gotta put the real dish somewhere. So even though some of my DPW traffic seems to visit this blog as well, here's what I really think. I desperately want to get back to a more "Hatfield-esque" approach in general and sort of knew where I wanted to go with the camellia. But after I planned, shot and drew it, I took for-freaking-ever to start slapping on paint. Hence the little procrastinating diversion of the DPW Bathing Woman Challenge. Even though the camellia may still not be all I had hoped (come on, you know nothing ever is) it is so completely worth the enormous (for me) effort to loosen up. People seem to like the one below, but I wish I had taken more of the same approach. I'm off to pluck a pink one now. Have decided I need more flowers to show at Ironstone Vineyards next weekend and at the Carmel Valley Garden Show in May, where my sweet and wicked funny friend Kathy Klawans Smith has generously invited me to hang a few things in her booth. She is brilliant landscape architect and also makes gorgeous jewelry, which you can see at Venice in the Valley.